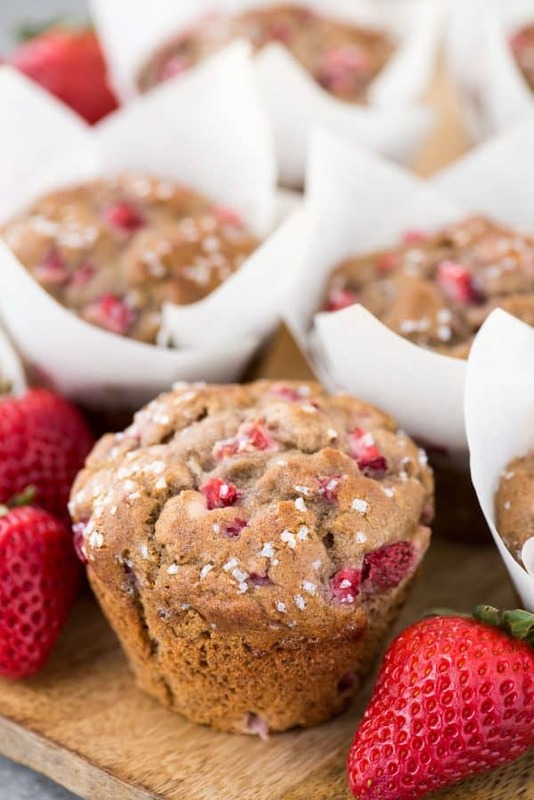 But after a long Michigan winter where school was cancelled 12 days in 3 months, these strawberry banana muffins taste like spring. 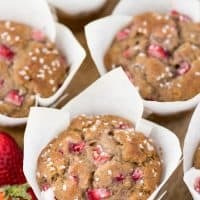 Can I make strawberry banana muffins with frozen strawberries? Frozen bananas? Let’s talk about the strawberries first. 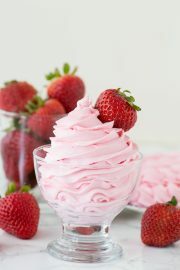 You can use fresh or frozen (and thawed) strawberries to make the strawberry banana puree that goes into the batter. However, if using frozen but thawed strawberries to dice up and fold into the batter, be sure to pat them on some paper towels to absorb the excess liquid. You can place overripe whole bananas in the freezer! 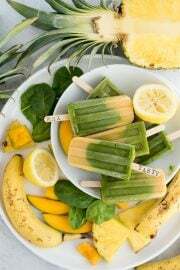 Our freezer is usually stocked with frozen bananas for smoothies and quick breads! Microwave the frozen banana in 30 second intervals to thaw. Let the batter rest for 15 minutes after it’s mixed and before you scoop it into the muffin pan. 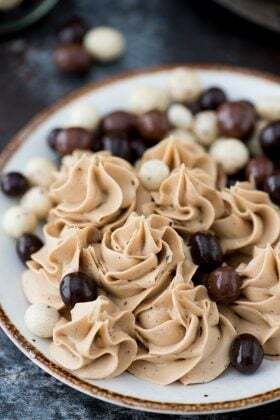 During the resting period, starch molecules in the flour are absorbing the liquid in the batter, causing them to swell and giving the batter a thicker consistency (ref the kitchen whisper). Our 15 minute rest is just a quick rest. You can also cover and refrigerate the dough for 1 hour or overnight before scooping into the pan. The longer the batter has to rest, the thicker the batter will become – meaning more DOME! Bake the muffins at a high temperate (425ºF) for 7 minutes then lower to 350ºF. Starting the muffins off at a higher temperature causes the batter to rise rapidly, producing a domed shaped. 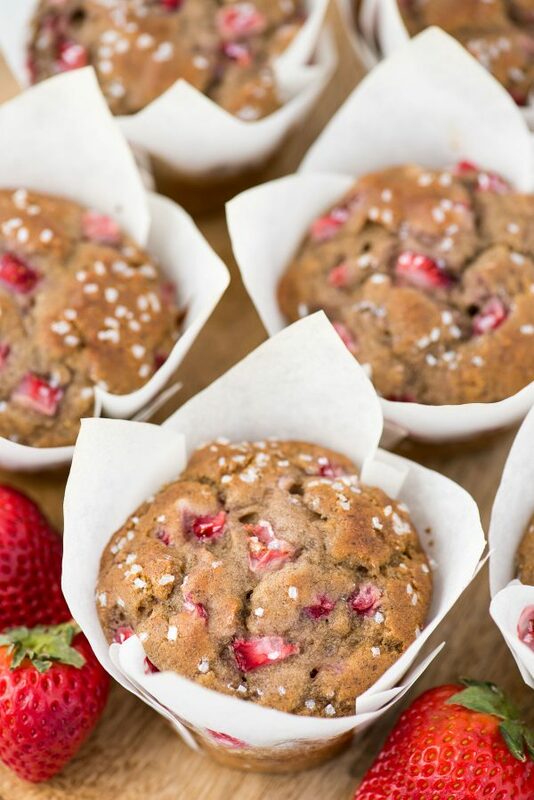 Fill your muffin liners to the top with batter. 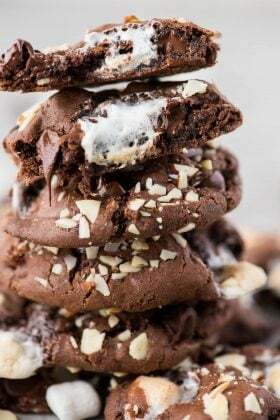 Yes, this goes against everything you’ve heard but it’s important in helping the muffin gain that height. 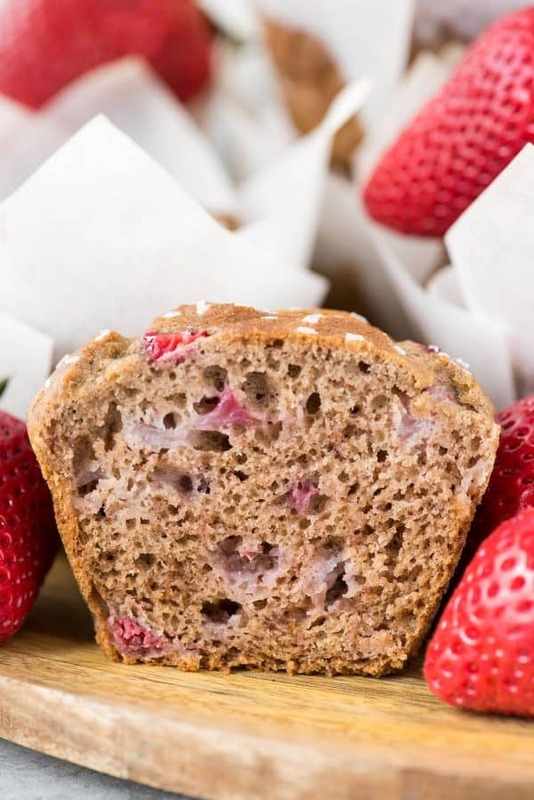 I’ve made these strawberry muffins with both regular and gluten free flour with AWESOME results on multiple occasions. I recommend King Arthur’s Gluten Free Measure for Measure Flour. Use it as a one for one substitute for regular flour. 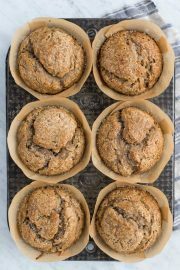 These muffins are naturally dairy free! 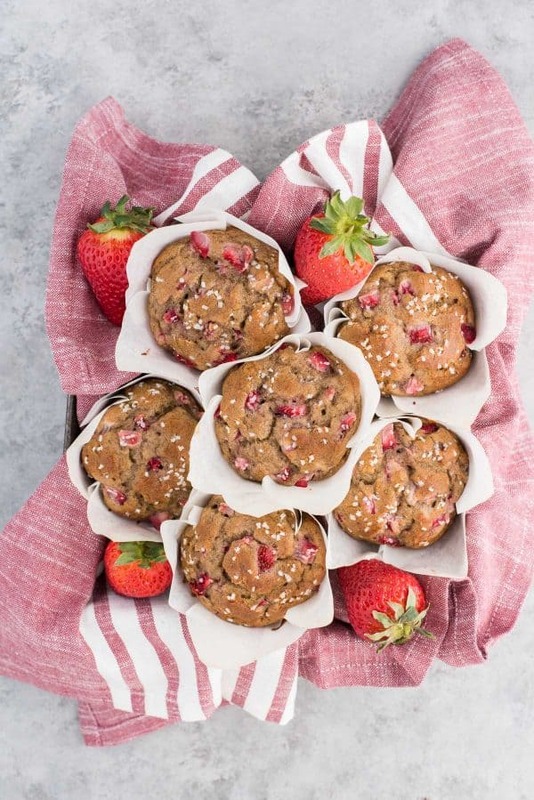 Can you freeze strawberry banana muffins? 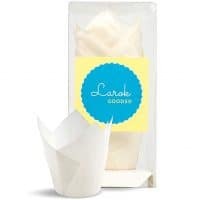 I used these tulip liners from amazon. 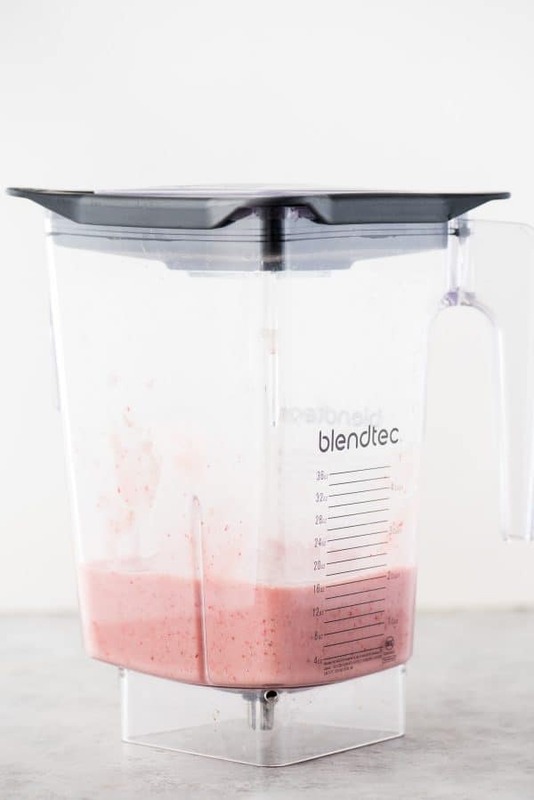 Blend the bananas and 1/2 cup diced strawberries in a blender until smooth. 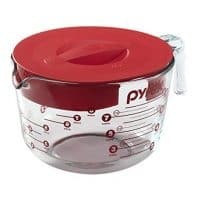 In a mixing bowl combine the banana strawberry mixture, vegetable oil, sugar, egg and vanilla extract. 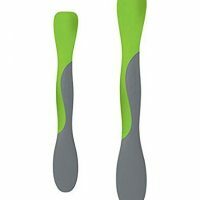 Stir to combine with a spatula. Add in the flour, baking soda, and salt, stir together with a spatula. In a separate mixing bowl, combine 1 cup of the diced strawberries with 2 tbsp flour, toss to coat. 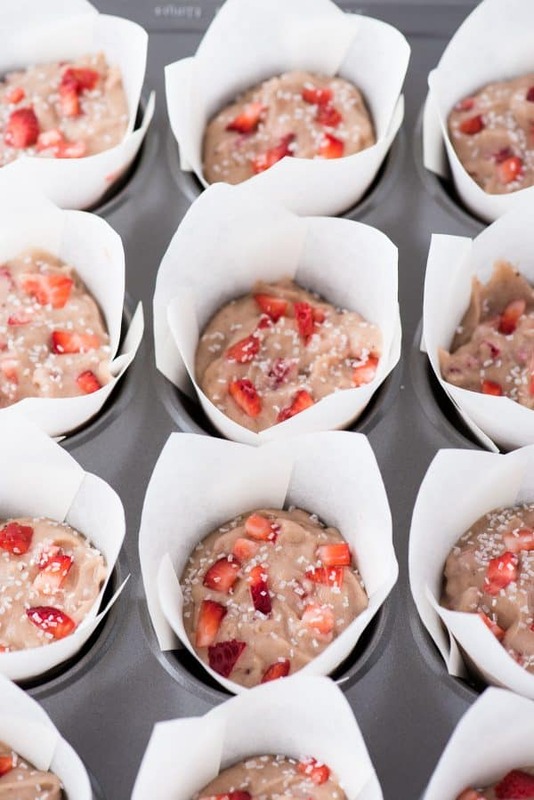 Fold the flour coated strawberries into the batter with a spatula. NOTE: Reserve 1/4 cup diced strawberries for the tops of the muffins. 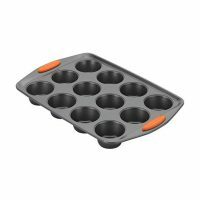 Line a muffin pan with muffin liners. We used these tulip muffin liners. Fill the liners to the top with batter. 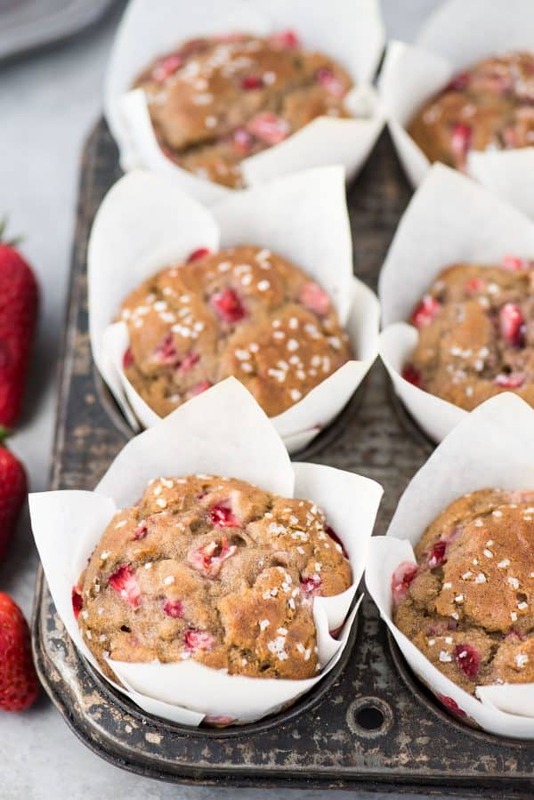 Add diced strawberries to the top of each muffin. Add course sanding sugar if desired. 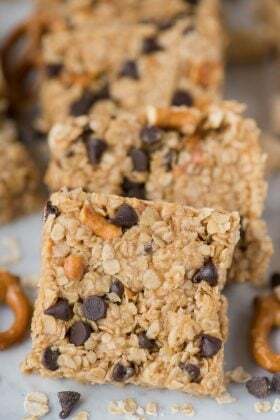 Bake for 7 minutes at 425ºF, then keeping the muffins in the oven, turn the temperature down to 375ºF and bake for 19-21 minutes or until a toothpick inserted in the center comes out clean. Allow the muffins to cool for 10 minutes in the pan, then remove them and allow them to cool on a cooling rack. If using frozen but thawed strawberries to dice up and fold into the batter, be sure to pat them on some paper towels to absorb the excess liquid.